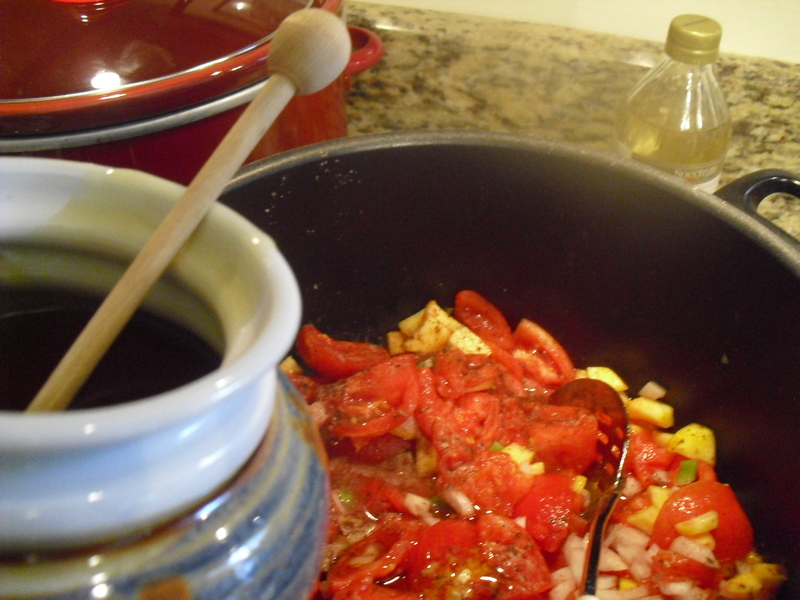 The bounty of luscious and plentiful fruit and vegetables of warm Summer days stimulate creative days in the kitchen. 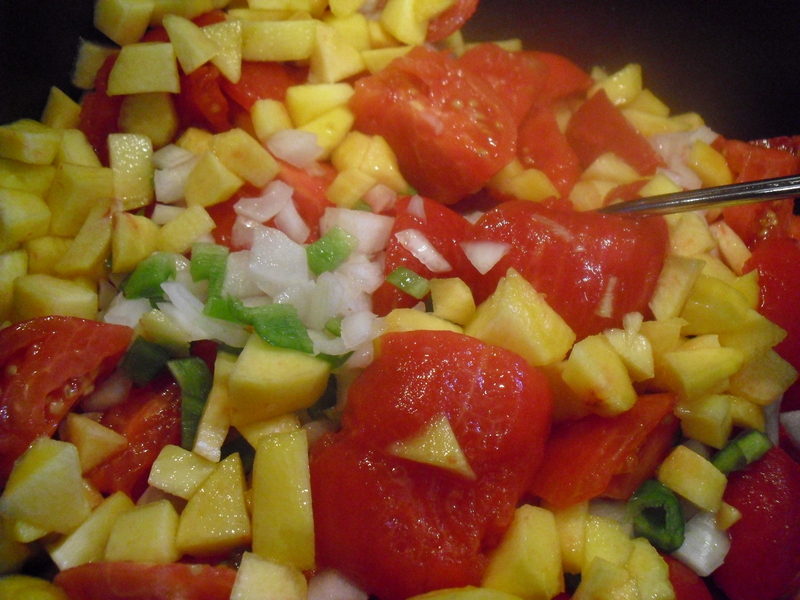 Today was such a day when I used available foods and spices to make a tomato-peach salsa. Sooo good with a meat entre for dinner!! Our tomatoes are producing generously this year. We are enjoying our fill of bacon and tomato sandwiches, tomatoes stuffed with tuna salad, sliced tomatoes drizzled with olive oil, balsamic vinegar, as a side dish of breaded tomatoes. The best is grabbing the salt shaker and eating a freshly picked whole tomato warm from the Summer sun…tomato juice dripping through our fingers, as we hold our heads over the sink..
Today, I noticed two peaches sitting on the kitchen counter beside the basket of tomatoes we had just harvested. 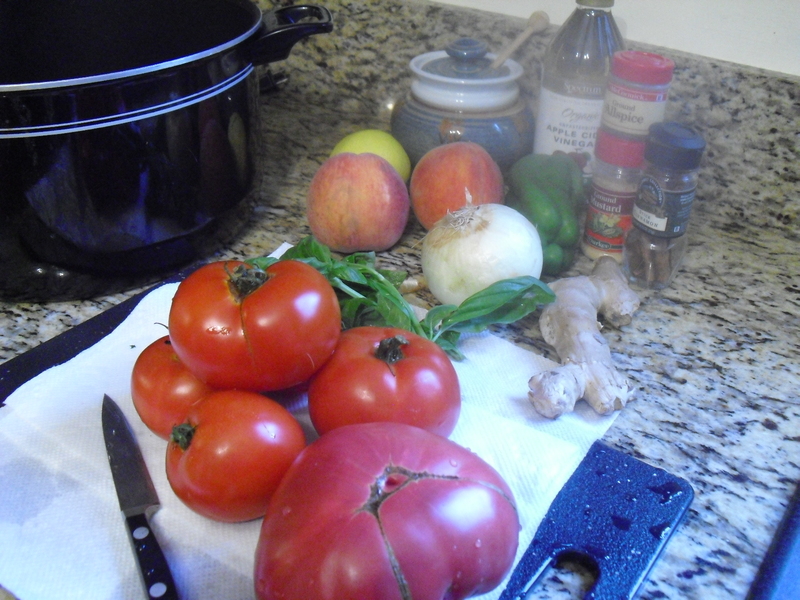 The thought occurred that I might develop a salsa recipe that we could use with the pork roast I had cooking in the crock pot. 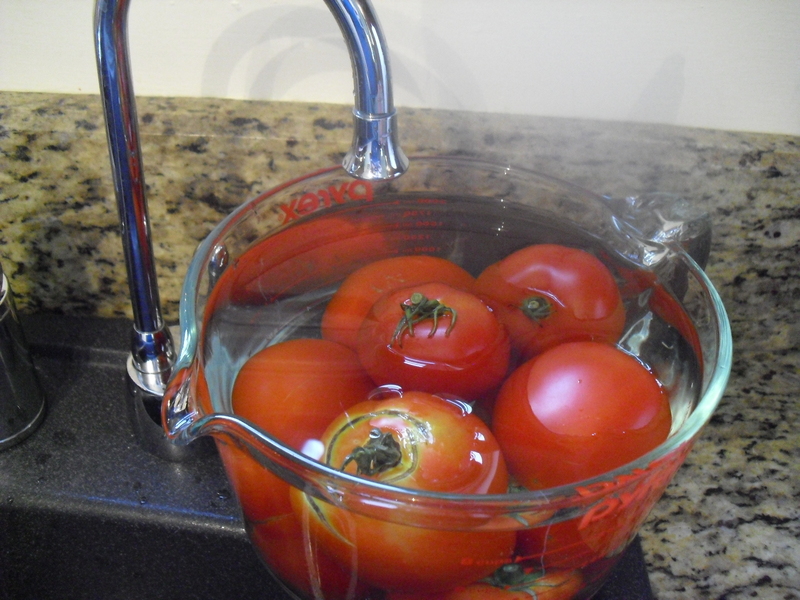 The first step was to wash the tomatoes and cover them with boiling water for 30-45 seconds so the peelings will come off easily. One of the features in our new house that I love is the boiling water faucet in the kitchen (Thanks Peggy, for including it in the kitchen remodel!.). And, it really works too. 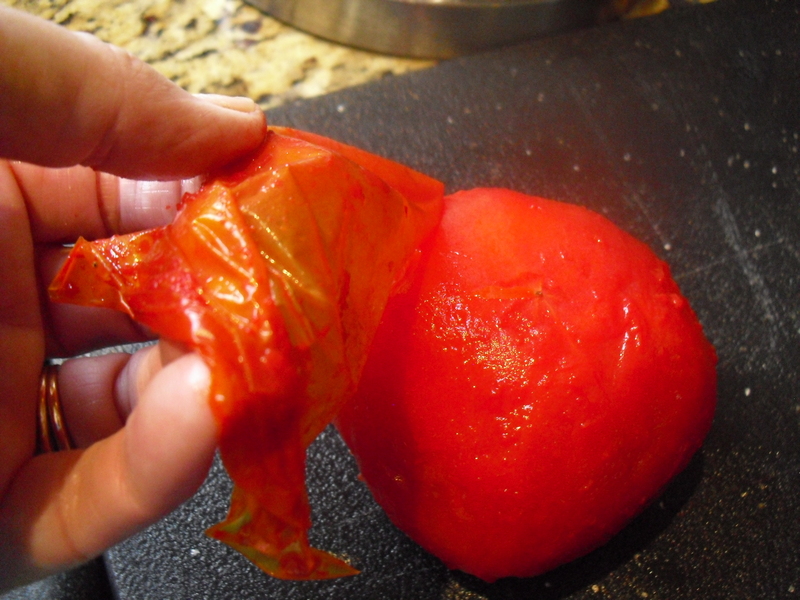 So much easier than trying to peel the tomato skins off. 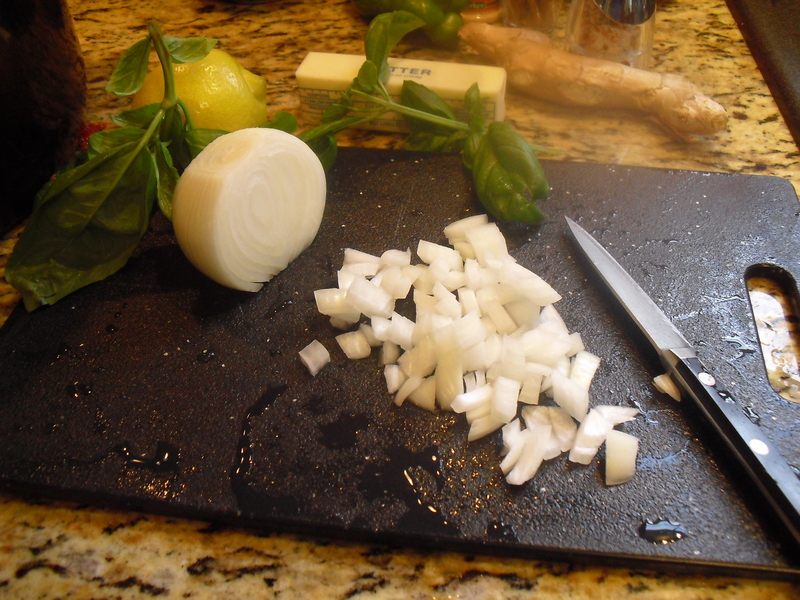 When I am creating a new recipe, it’s a little of this and a pinch or splash of that. So, I will share the approximate measurements. You may want to adjust several of the ingredients for your own tastes. 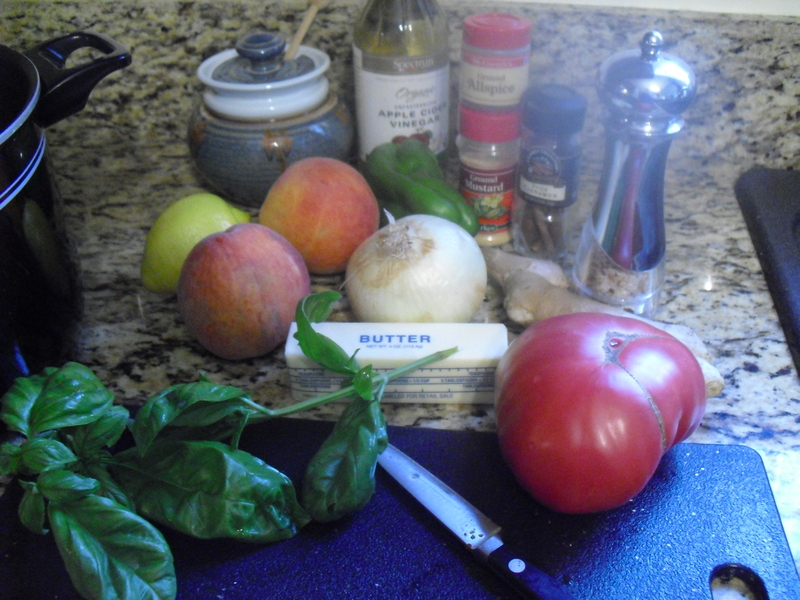 The salsa I made today includes peeled and quartered tomatoes (about 5 cups), two peaches, lemon juice (about 1/4 cup),apple cider vinegar (about 1/4 cup), honey to taste (1/2 cup), 1/2 diced green bell pepper, 1 tablespoon minced basil, 1 tablespoon minced gingerroot, 1 medium diced onion, black pepper, red pepper flakes, 1 teaspoon cinnamon, 1 teaspoon allspice, 2 tablespoons butter and 1/2 cup raisins. 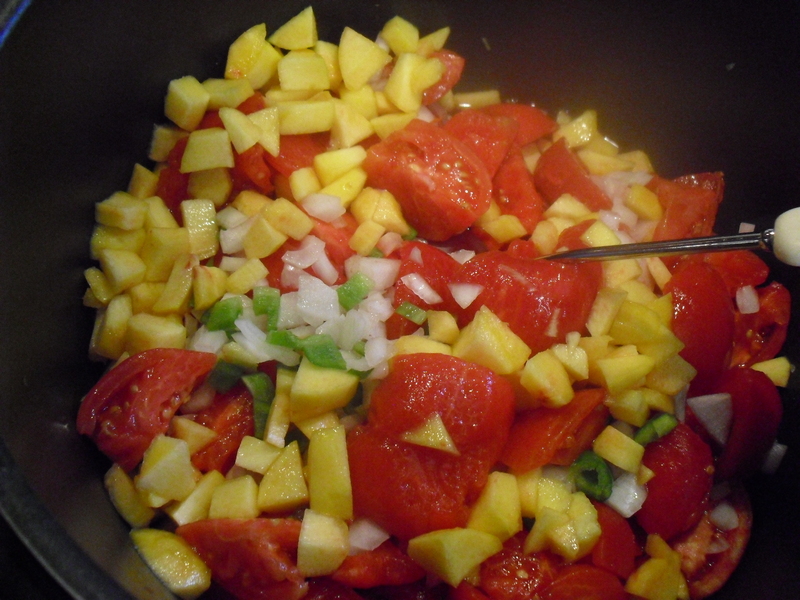 Cook at gentle boil until thickened, stirring occasionally to prevent sticking. 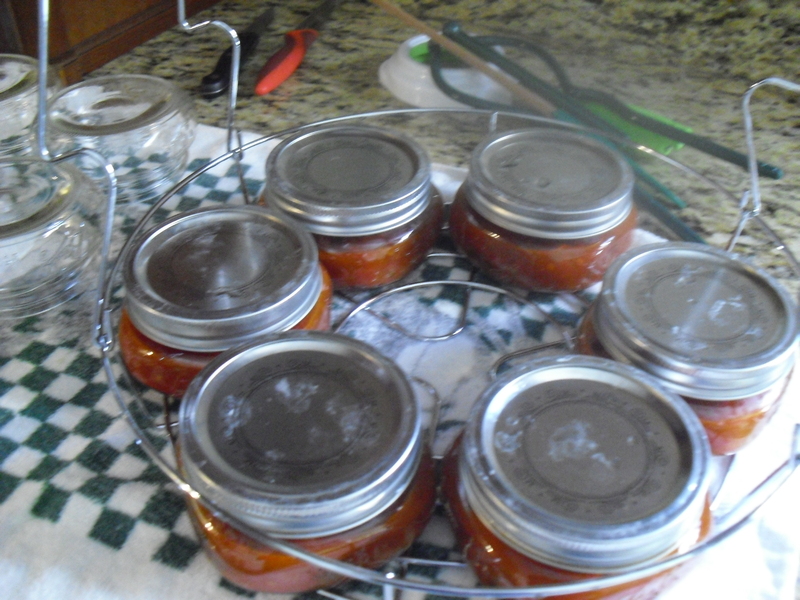 The tomato-peach salsa was processed in a boiling water bath for 10 minutes to seal canning jars. 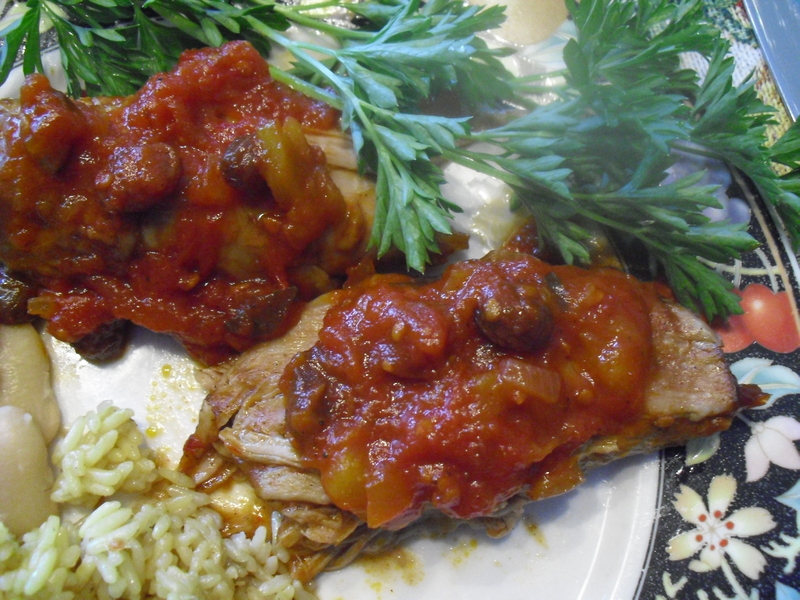 The crock pot pork roast was tender and juicy and ready for dinner when the salsa was done. 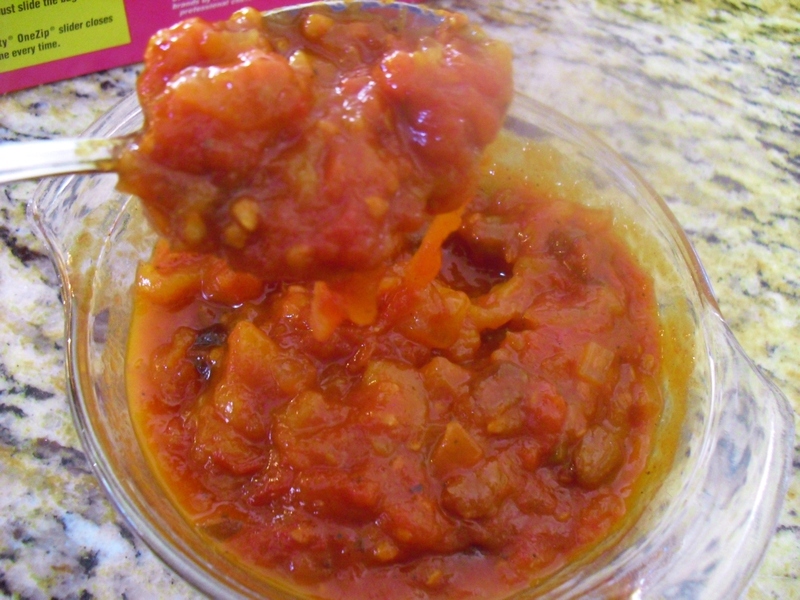 The meat-salsa combination was delicious… spicy and sweet-tart. We munched on turkey sandwiches on sour dough rolls for lunch the next day. 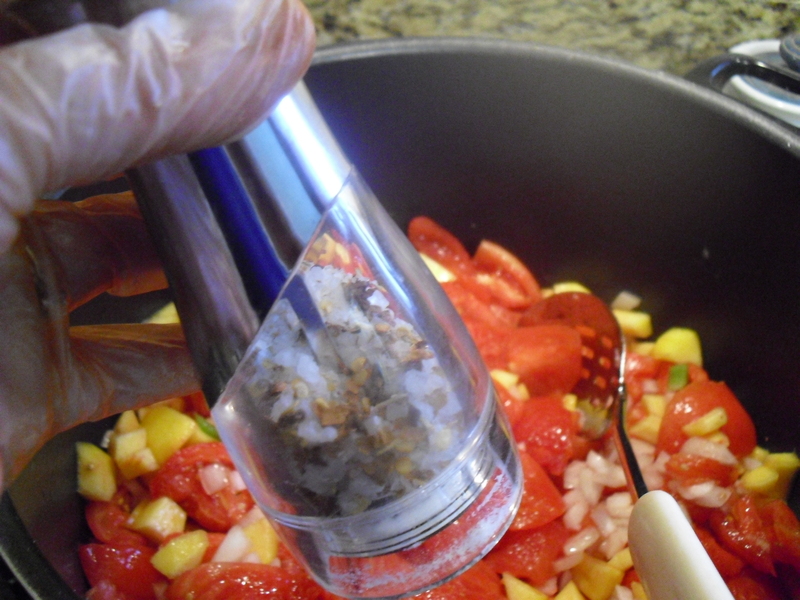 The tomato-peach salsa made the sandwiches extra special with icy orange-ice tea. I’m so glad I made enough for another day. I’m in awe and have a mouthwatering desire for salsa. If I don’t follow a recipe I’m in deep trouble but yours look perfect. 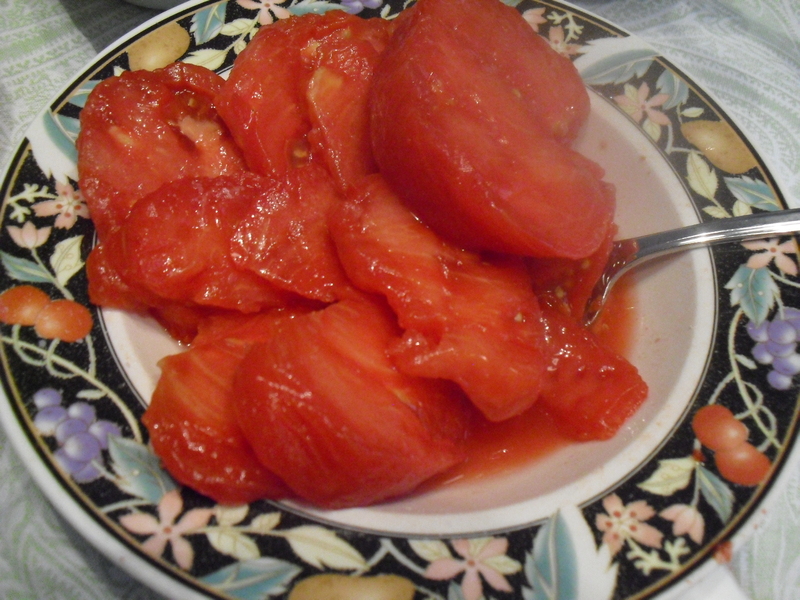 I never would ave thought of combining peaches with tomatoes like this but you’ve convinced me to give it a try. It really does sound good, Sue, and I like its paring with pork, as you did. Thaks for sharing. Good morning. Hope all is well with you. What a great combination! 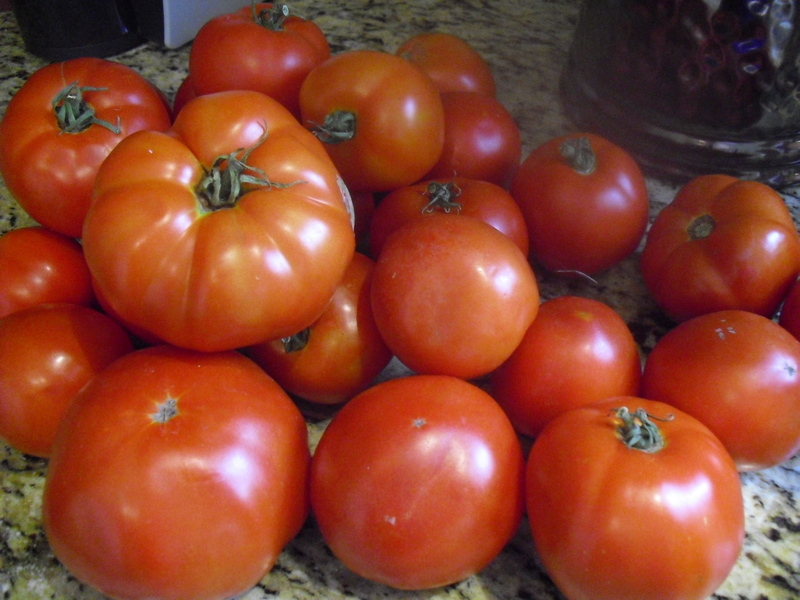 I am so envious of your tomato harvest. One thing about living in Britain is the abysmal conditions for growing warm weather veg. Tomatoes do not fare well outside greenhouses, and even then they are prone to blight. Despite that, I’ll be trying this recipe soon. I think most food products are more expensive here. When comparing grocery bills with my sister in Pennsylvania, we realised that we spend about the same – her in dollars and me in pounds, but given the exchange rate that means I spend 1.7 times what she spends for similar things.